The first thing I did on buying a new house in November was to have solar panels installed. Like, within 24hrs of having keys in hand I’d had two companies round to try and sell me their wares and made a decision. The installation was not the easiest, as December 4 coincided with Storm Desmond and the house gets fairly battered by the wind at the best of times. That, and it’s taken another week to get everything wired-up and configured. It’s also not been the best of weather – cloud, foggy, rainy and windy – for the past week as well. 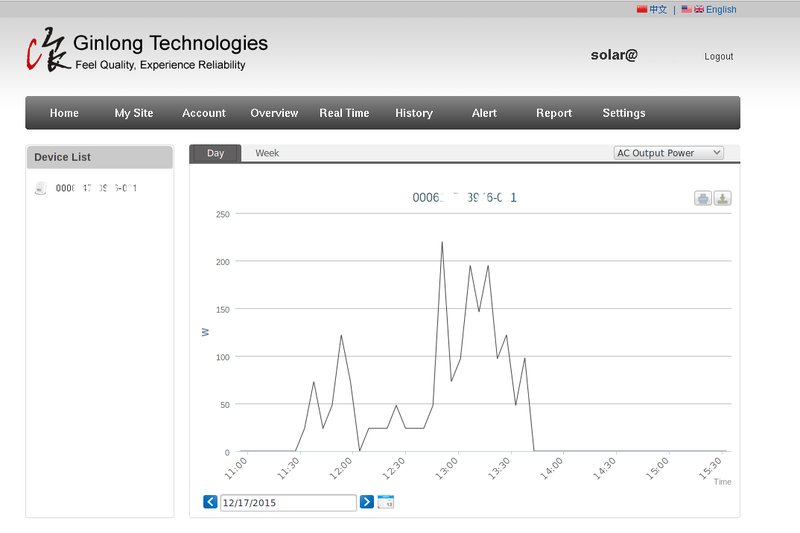 So today has been the first real day of generating electricity – with actual data-logging of some sort. I’m well happy to have seen a clear couple of hours around lunchtime in which generation peaked at just over 200W. This entry was posted in Geek, home and garden, words and tagged data, electricity, first day, microgeneration, power, solar, solar panels, weather.